Suddenly he seems to switch over to two other categories; no, kshhetraM is prakRRiti and purushha is kshetrajn~a, as is clear from the context. This is where he gives in a crystallised essence the matter we have been discussing – namely nitya-anitya-vastu vivekaM. What is known in sAnkhya shAstra as purushha is the Absolute Reality of advaita shAstra known as Atman and Brahman. What is called prakRRiti there (in sAnkhya) is MAyA here. Of course there is a slight difference; but the fact that prakRRiti and purushha is the MAyA and the Atman, respectively, is 99 percent. true. It is well known that the Atman is the eternal Truth (nitya). So what is meant by nitya-anitya-vastu-vivekaM is nothing but the comprehension of the Atman as separate from the effects of MAyA. In the word ‘AtmA-anAtma-vivacanaM’, the anAtmA is nothing but MAyA. So, to know the distinction between prakRRiti and purushha is to distinguish between anAtmA and AtmA. For an Atma-JnAni there is nothing like anAtma. But being an Atma-JnAni is in the future. There is a work called “prouDhAnubhUti” by the Acharya, a wonderful rendering in a majestic manner of the status of a JnAni, written in such a ‘madness’ full of advaita-Ananda, that could be even mistaken by unknowing people as a kind of pride. 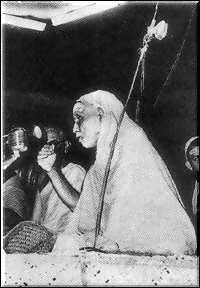 In fact, [the Mahaswamigal adds smiling] the ‘pride’ justifies the name ‘prouDhAnubhUti’. In this the Acharya says very emphatically: “It is absurd to talk about Atma-anAtma – vivechanaM. Is there a thing like anAtma? If there is one such then how can it be negated out of existence?”. But remember, this is the statement of one who has had the anubhUti (the Experience). But, for those who have yet to reach that stage, the question that looms large is : “Is there something like the Atman? It is only anAtmA that seems to be everywhere”! For all those who have not yet reached that apex of jnAna, it is necessary, during their efforts on the journey, to be alert and to keep sorting out with discrimination, which is the one that is really eternal, which is the one that is the impermanent anAtmA, and what those are that, though impermanent, would be able to help us go to the Eternal Permanent entity, and what those are that, being impermanent, would drag us deep into further impermanence. The Acharya, in the last but one shloka of his Bhaja Govindam, has recommended us to do this sorting between Atman and anAtmA very carefully: *prANAyAmaM pratyAhAraM nityAnitya-viveka-vichAraM*. The shloka after this in Bhaja GovindaM is a phala-shruti.